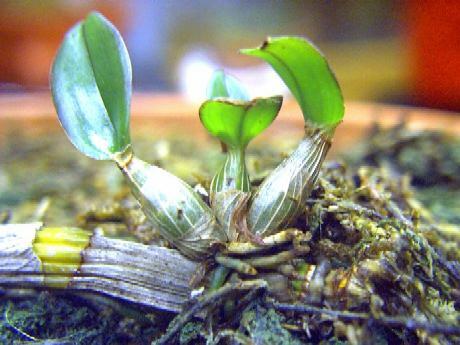 Two weeks ago I noticed one of my dendrobium (den-droh-bee-um) orchids had formed three little keikis (babies) on one of the pseudobulbs. I broke the large bulb off and laid it back on top of the sphagnum moss so the keikis could sink their roots into the moss and watered them well with only trap water. The keikis were looking pretty healthy and starting to fill out and become plump little things with nice little leaves untill my cat chewed on the leaf tips. A week later it was time to water and fertilize all of my plants. I mixed the orchid food with trap water, sat the orchid pot down into a large bucket type container for soaking. Then I took a basting bulb and began to drizzle the liquid onto the keikis when all of a sudden I saw something happen right after drizzling the liquid over the keikis for the third time. I saw a brilliant blue white flash of light, the three tiny pseudobulbs swelled to their fullest and became about half again larger, small specks of white light sparked all around the tiny leaves on each of the bulbs. It really looked as if I literally saw them grow right before my eyes, even the color is richer looking then it was before. I'm not really sure what it was that I saw, a phase shift, actual growth or what, but I DO KNOW I saw something happen!! Perhaps the trap water responded to the plant food as if given instructions. Below are the keikis after this happened. Today, Feb. 16th, after misting my orchid cactus with freshly drawn m-state trap water only, I saw something happening after a few seconds as I went onto mist other plants. The tip of the plant literally turned a bluish green. I grabbed the digital camera, put both the + 10 and + 7 lenses on, turned the camera on and the battery light went off. I ran for the camera adaptor, got that plugged in and back to the window where the orchid chactus sits only to find that the color show I saw was over. 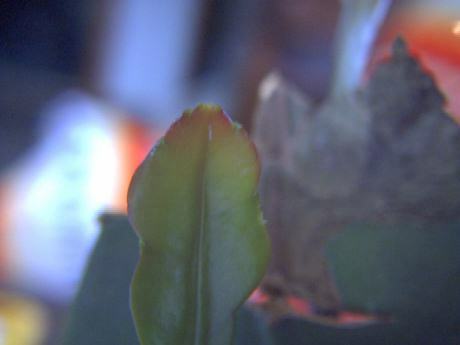 I started to put the camera away, as I turned I saw a spark of light, so I snatched up the plant, set it down on a tv table with my back to the windows so the lighting was behind me and took photos as fast as I could with the available light, NO FLASH used!! The color I saw disappeared and flashes of light started appearing. 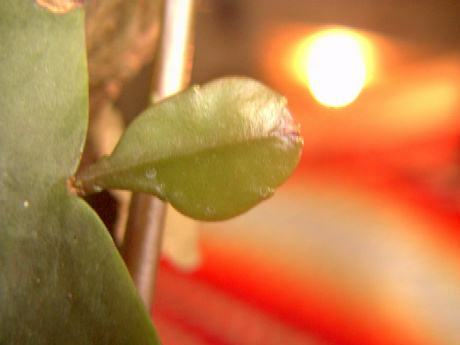 Please note the spot at the tip of the young leaf. Original - No gamma or color corrections. Negative of the above - No gamma or color corrections. 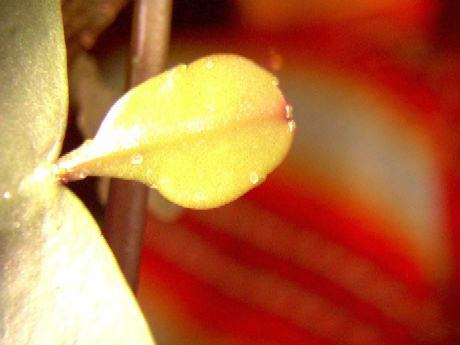 Note the point off of the spot above the leaf. This is the same plant but a different leaf - please note the spot at the edge of the leaf. Please note the angle of the point off of the spot, it is at a different angle then the above. This is NOT a spot on the camera lens. Negative of the above - No gamma or color corrections. This is the same leaf as the above 2 photos and the second photo taken right away after the above was taken. Original - No color or gamma corrections. 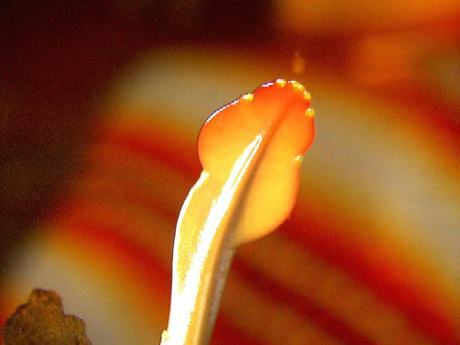 All photos from on down are of the of the same leaf. Negative with gamma at minus .75. Note the rectangle in the center of the circle. Is this just pixellation or a dimensional door in the center of the light? Same plant and again, NO flash was used! HMMMM, what is this at the left side of the leaf? No gamma or color corrections.